ROSBORO X BEAM 24F-V4 | International Wood Products, LLC. 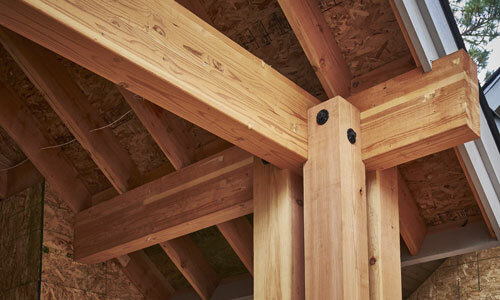 Rosboro’s X-Beam is the building industry’s first full framing-width stock glulam in an architectural appearance grade. X-Beam eliminates the need to fill the 3/8″ gaps that 3-1/8″ and 5-1/8″ beams create. For builders, this translates to lower installed costs and more efficient framing. Key advantages include cost-effectiveness, architectural appearance, lighter weight, greater strength, single-piece installation, compatibility with I-Joist and traditional depths, and wet-use adhesives. 3-1/2" x 7-1/2", 9", 9-1/2", 10-1/2", 11-7/8", 13-1/2", 14", 15", 16", 18"
5-1/2 x 6", 7-1/2", 9", 9-1/2", 10-1/2", 11-7/8", 13-1/2", 14", 15", 16-1/2", 18", 19-1/2", 21", 22-1/2", 24"
6-3/4 x 9", 10-1/2", 11-7/8", 13-1/2", 15", 16-1/2", 18", 19-1/2", 21", 24"